The eye is the most crucial of all human sense organs. And, one of the most important parts of eye is the cornea. It is the frontal part of eye which covers the other important parts like the iris, pupil, and anterior chamber. Along with other structures, it contributes to the major functioning of the optical power of the eye. Unfortunately, it is prone to disease. But due to the advanced developments in medical sciences, corneal diseases are highly treatable or curable. Among these, keratoconus is an unusual degenerative kind of disorder, in which the cornea undergoes structural changes. It turns out to be a more like a conical shape, away from the normal curvature. In addition, the thickness of the cornea is severely reduced or thinned. All this leads to the distortion in the formation of image of an external object. Due to the uncommon distortion in the images, it has been classified under the corneal ectatic disorders. One of the effective treatments to cure keratoconus is corneal collagen cross-linking. It’s a technique which utilizes the UV light and a photo-sensitizer primarily to strengthen the collagen bonds in the cornea. This technique is popularly known as CXL, C3-R, CCL and KXL. It is intended to prevent the further irregularity in the changing shape of the cornea. It’s a surgical technique which allows riboflavin to diffuse into the cornea. Riboflavin is a vitamin (a part of vitamin B group) which helps in preventing the further degeneration of the cells of the cornea, by forming new bonds across adjacent collagen strands in the stromal layer. As a part of the treatment of keratoconus, an Intacs implants or inserts are often used as a minimal invasive surgical option. These inserts help to correct vision by flattening the cornea and thus allowing more light to enter into it with less distortion. The flattening of the steep parts of cornea or cone can enhance visual acuity and improve contact lens fitting. Intacs are made of a biocompatible material, and therefore, have lesser risk of side effects to the cornea. The cornea is a critical part of our vision, any defect in the cornea and distortion in the vision must be treated immediately. For this, it is essential to find a skilled eye physician or trained optometrist to help monitor or treat your condition. If you are searching Google for “a doctor near me”, consider a consultation at Clarence Eye Care where Dr. Murphy and Dr. Bartels are trained experts in the care and management of keratoconus patients. Unless you’re an avid hunter, marksman, or archer, you may not be aware of which of your eyes is “dominant.” About 2/3 of people are right-eye dominant and about 1/3 are left-eye dominant (there is a small percentage that are “no eye” dominant, meaning they prefer either eye equally). While eye-dominance has an effect on certain treatments for the eye (especially monovision, where the eyes are purposefully given different prescriptions to reduce need for full-time glasses in certain patients), eye dominance is a completely normal phenomenon. Preference for one eye over the other when shooting, using a microscope, threading a needle is normal and completely expected; rarely is such a preference indicative of an unhealthy or complicated eye. An easy, at-home determination can be performed by just about anyone! 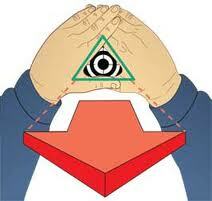 Holding your arms extended in front of you, look through the “triangle” at a smallish object in the distance. Close your left eye. Can you still see the object? If so, you’re right-eye dominant! If you “lost” the image by closing your left eye, alternate eyes, leaving your left eye open and your right eye closed. Can you still see the object? If so, you’re left-eye dominant! That was fun, wasn’t it? We can’t wait to have you stop by to see us at Clarence Eye Care located at 8560 Main Street in Williamsville. We would be happy to assist you with any of your eye care needs. Sunglasses with UV-protection are vital in shielding your eyes from harmful, potentially severely detrimental, complications to your eyes. Both UV-A and UV-B light can be linked to multiple eye disorders, including macular degeneration, cataracts, pinguecula, pterygium, photokeratopahy, and cancers. Up to ten percent of skin cancer occurs on the eyelids alone! UV damage to the eye is irreversible and continues to build through years of exposure. Damage to the eyes is especially concerning as the eyes have the only internal tissue readily exposed to direct UV light. Prevention is a key element in combating the diseases associated with ocular exposure to damaging UV light; investing in quality protective sunglasses can be a sufficient enough step in staving off complications from exposure to UVs. It doesn’t have to be all doom and gloom, though! Sunglasses with UV protection are readily available and easily accessible at our optical department at Clarence Eye Care located at 8560 Main Street in Williamsville, NY! They provide stylish, affordable, and protective eye wear which can help reduce your risks of ocular complications from UV light exposure. But It’s So Bright Out! Your annual eye exam should be a relatively painless appointment. That being said, there is a rather important area of contention between doctor and patient: dilation. Dilation is the instillation of topical eye drops that widen the size of the pupil, allowing for easier viewing of the posterior, or back, of the eye. With dilation your doctor can achieve an unrestricted view of your blood vessels; the eye is the only organ that allows for unrestricted viewing of the blood vessels! Dilation can aide your eye care professional in diagnosing and beginning treatment for many diseases, including diabetes, tumors, hypertension, and retinal detachments. Although its benefits outweigh the slight inconveniences, it should be noted that dilation can be a bit obtrusive; dilation can temporarily cause increased sensitivity to glare and light and can cause decreased near visual acuity. So when should you be dilated? Well, it can vary greatly from person to person, but a good estimate is annually. Once a year, make arrangements to have a friend or loved one drive you home from a dilated exam, or, prepare a set of dark sunglasses ahead of time to wear while driving home on your own. If you have certain systemic diseases like diabetes or hypertension, or if you have a history of ocular disease or defect, your eye care specialist may recommend that you be dilated more frequently. Dilation can certainly be inconvenient, but it potentially can save your vision or your life! So, get yourself some sunglasses, a friend to drive you, and a free afternoon, and get your annual dilated eye exam; your eyes will thank you for it! It is imperative to have a work station that is set up properly. Too often, people are working in uncomfortable surroundings. More than 50 percent of computer users experience computer vision syndrome in the form of eyestrain, headaches, blurred vision and other visual symptoms related to sustained use of the computer. 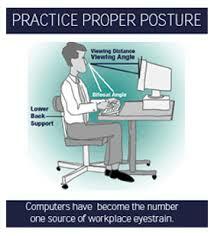 Stressing the visual system can lead to body fatigue and reduced efficiency at work. You can avoid or manage some of these symptoms by rearranging our routine and lighting conditions, and purchasing anti-glare accessories that can reduce light reflections. Staring at the screen from a close distance may be damaging to your eyes. For most people, a comfortable screen to eye distance is between 22 inches (56 cm) and 36 inches (91 cm). The monitor should also be positioned so that your eyes read the top third of the screen instead of looking directly at it. Having the proper body posture and orientation will also help to alleviate muscle strain by keeping your head and neck level. Glare is the second biggest complaint from users with computer vision syndrome. Glare can be categorized into either direct or indirect glare. Glare can be caused by sunlight coming through the window (direct glare), overhead fluorescent lights (direct glare) and desk lamps that reflect (indirect glare) onto the screen from various angles and “wash out” parts of the screen and reduce contrast. If you are close to a sunny window you can minimize computer vision syndrome by closing or adjusting the blinds so light does not fall directly onto your monitor. If that is not possible, try to turn the monitor so that the light does not hit the screen directly. On the other hand, try to avoid working in a dark room. If you must work in near dark conditions, try dimming the brightness of the screen and take hourly breaks to limit eye strain. The effects of overhead lights and their relationship to computer vision syndrome is often overlooked but can definitely cause problems. If you have fluorescent lights make sure that you are using the “cool white” tubes. If you have incandescent lighting, try to use a desk lamp next to the monitor instead of the overhead light. Your monitor throws its own light, so you really only need adequate indirect light around you. 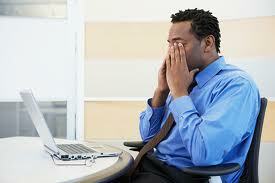 You should also schedule breaks away from the desk to move your muscles and refocus your vision when suffering from computer vision syndrome. The “Twenty-Twenty” rule is a good rule-of-thumb. Every twenty minutes, take a twenty second break, and look twenty feet away. You may also consider increasing blood flow throughout your body by stretching your muscles and resting your hands. Go get a coffee or take a bathroom break to stretch your legs. If you can’t get out of your seat, try turning your head slowly from side to side and roll your shoulders simultaneously several times. You can extend your legs under the desk and roll your ankles. I hope that this has been helpful in reducing some of your computer vision syndrome symptoms. For any other concerns or questions, please stop by to see us at Clarence Eye Care located at 8560 Main Street in Williamsville, NY or call us at 716-668-2020 to schedule an appointment. So, you are here because you were diagnosed with corneal disease called forme fruste keratoconus, keratoconus, or pellucid marginal degeneration. Keep in mind that there are many, many ways to treat keratoconus that weren’t even available just a few short years ago. Dr. Michael Murphy and Dr. David Bartels specialize in fitting specialty contact lenses for the corneal diseases like keratoconus. Let’s start with the mildest form of keratoconus called forme fruste keratoconus. This form is a very early form, sometimes very difficult to diagnose. However, eyeglasses or soft contact lenses may help. But as the corneal disease progresses and the cornea thins and ultimately changes shape even more, glasses or soft contacts may not correct the mild form of this corneal condition. If your keratoconus continues to progress and worsen, glasses or soft contacts may no longer control your corneal disease. Rigid gas permeable contacts are a great option to consider at this point. The firmer the material of the rigid lens (compared to a soft lens) vaults over the irregular cornea to improve vision. Small rigid lenses can be uncomfortable so here at Clarence Eye Care, we specialize in scleral contact lenses. These scleral lenses are larger in diameter than the older rigid gas permeable contacts that many former contact lens wearers are familiar with. Larger diameter contacts have improved the comfort of wear considerably. In fact, many scleral contact lens wearers say the comfort is similar to a soft lens if fit properly. Fitting a specialty scleral contact lens on a keratoconic cornea is delicate and time-consuming. You can often expect that the first visit will take 45-60 minutes to fit. The significant improvement in vision that you attain is well worth the time, however. If your keratconus is severe, we may consider corneal Intacs or inserts which received U.S. Food and Drug Administration approval for treating keratoconus in August 2004. However, the first cases were done in the U.S. as early as 1999. These plastic intacs are placed just under the eye’s surface in the periphery of the cornea, which help achieve a flatter cornea leading to clearer vision. Intacs may be needed when keratoconus patient no longer can obtain functional vision with contacts or eyeglasses. Several studies have found that Intacs improved keratoconic participants eyeglass-corrected vision by an average of two lines on the standard Snellen eye chart. Intacs have the advantage of being removable and exchangeable in a process that may take as little as just 10 minutes. Intacs may delay the progression of keratoconus but the will not prevent a corneal transplant if the corneal disease continues to progress. Infection, little to no improvement in vision, glare, halos, foreign body sensation are all potential risks associated with Intacs. With these risks, it is important to be properly screened prior to considering this option. Collagen cross linking with riboflavin is another new procedure for treating keratoconus. It is considered a non-invasive method of strengthening the corneal tissue to slow down or halt the bulging of the corneal surface. Specially formulated eye drops containing vitamin B2 (Riboflavin) are placed on the cornea. Then the vitamin B is activated by a special light to strengthen the connective tissue (collagen) within the eye. Corneal collagen cross linking is not currently FDA approved in the U.S., however, a German study in 2003 revealed that this form of treatment stopped the progression of keratoconus in all 23 eyes of 22 patients. This technique may considerably reduce the number of corneal transplants currently performed on keratoconus patients. 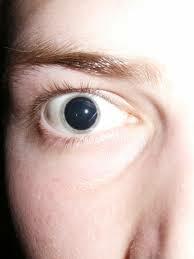 The last remedy available and the last resort is a corneal transplant, or penetrating keratoplasty. Our goal is to NEVER get to this stage. With all the advancements in technology, we feel that this is not an option and will do our best to protect you from this stage. If you have had trouble finding a contact lens to fit your irregular cornea, or you just want a second opinion, please call us at Clarence Eye Care. We would be happy to sit down and discuss all your options with you. Together, we can come up with your best plan of treatment. What is a Keratoconus Diagnosis? Keratoconus can be a very debilitating condition if untreated but it is manageable. There are numerous ways to administer care for this condition that were not available even just a few years ago. Keratoconus is a corneal disease that often appears in the teens, twenties, or early thirties. It is a progressive corneal condition in which the normally round cornea thins and begins to bulge into a cone-like shape. The coned shaped cornea then then deflects light as it enters the eye on its way to the light sensitive retina, which ultimately causes distorted vision. 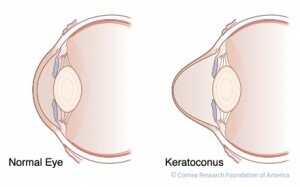 Keratoconus disease can occur in one or both eyes. Corneal diseases like keratoconus can be difficult to diagnose because it develops so slowly. However, there are some instances where it may progress rather quickly. Often times, nearsightedness and astigmatism will accompany this disease which can create blurry and distorted vision. Patients often experience glare and light sensitivity as a result. Like most patients in their teens, keratoconic patients often have prescription changes each time they visit their eye doctor. It can be difficult to diagnose this condition in the early stages if your practioner is not familiar with the early stage symptoms or he or she lacks the necessary equipment to measure the corneal curvature. At Clarence Eye Care, we have the latest and greatest technology to diagnose keratoconus. We also specialize in the most advanced contact lenses used to manage this condition. Stop in at 8560 Main Street in Williamsville (just outside Buffalo), New York or call us at 716-668-2020 for a consultation. Properly caring for your contact lenses also includes the importance of keeping your contact lens case as clean as possible. Too often, the case itself is neglected in the cleaning regimen. The case itself is a potential source of infection, especially since most of us keep the case on the bathroom vanity where it is constantly bombarded my microbial invaders. Picture this for a moment…your contact lens case has been in your bathroom for months without being replaced or cleaned. You are very diligent with taking your contacts out every night (never sleeping in them), and always using fresh solution to soak them over night. However, your case has not been changed or replaced in months or years. Where do you think your primary source of potential infection is coming from? It’s definitely NOT your contacts…it’s your contact lens case! I have seen numerous eye infections over the years. Vision threatening infections are always cause for concern. As your eye doctor, an eye infection can result in a sleepless night, because even though you may not take your contact lens care seriously, I do. I also know how quickly an infection can get worse, resulting in scarring, reduced vision, glare, halos, inability to wear contacts again in the future, and even loss of the eye completely in a worst case scenario. Getting your contacts to stay protected includes proper care and frequent replacement of your contact lens case. My recommendation is to change your case every month and minimum recommended change of every three months. Most studies done show that many patients get into trouble when the contact lens case is 7-9 months old. Your eyes are one of your most precious gifts. Give them the attention and care that they deserve by being diligent with changing your contact lens case on a more frequent basis. I will go as far as saying that if you aren’t doing it and you need a little motivation, just stop by at Clarence Eye Care located at 8560 Main Street in Williamsville, NY, let me know you saw this article and I will provide a FREE year supply of cases for you. I don’t get to watch much television, but I do enjoy watching Persons of Interest with my wife. The concept is a bit unnerving, honestly. If you’ve never seen the show, It is a crime drama on CBS. The series revolves around a former CIA agent (Jim Caviezel) recruited by a mysterious billionaire, formerly on Lost, (Michael Emerson) to prevent violent crimes in New York City. As the intro suggests, “You are being watched. The government has a secret system: a machine that spies on you every hour of every day. I know because I built it. I designed the machine to detect acts of terror, but it sees everything. Violent crimes involving ordinary people, people like you. Crimes the government considered irrelevant. They wouldn’t act, so I decided I would. But I needed a partner, someone with the skills to intervene. Hunted by the authorities, we work in secret. You’ll never find us, but victim or perpetrator, if your number’s up… we’ll find you”. With the advent of Google Glass and the similar Baidu Eye (China’s version of Google Glass), soon everyone and everything will be monitored and recorded, much like the show suggests. 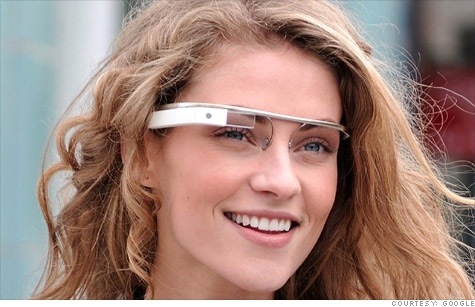 I’m sure that the original intent of Google Glass in to provide users with the ultimate in digital technology. Imagine hands free google searches, voice-controlled image recognition, bone-sensing capability, and even the possibility of using user’s gestures to take and send photos. Well, the concept is no longer just a dream, it will soon be a reality, possibly by year’s end. You have to admit, though, that there is a bit of a “creep” factor at play here. The blue tooth in the ear and families texting one another at dinner will seem like an improvement in comparison to this new social detachment. Plus, don’t neglect the fact that Google will know exactly where you are and what your looking at with this technology. These are scary thoughts, especially when you consider how distracted people already are with texting. Can you imagine the distraction of someone watching a YouTube video on their heads up display while driving down the expressway or walking down a busy city street? Google says that they have no plans to incorporate advertising but this is merely corporate speak. If they don’t advertise directly, they will surely track and use your natural eye movements in research to aid other companies in their advertising. I love new technology and as an optometrist in Buffalo, NY, I’m intrigued by the ocular integration of these “Glasses”, however, I do see some pitfalls with this medium that may be very problematic. Contact lens compliance is a major concern for most doctors. We are always concerned that patients will abuse their contacts, not properly clean or disinfect their lenses or contact lens case, and they will develop a severe eye infection that may permanently scar or damage their vision. I think patients are sometimes influenced by marketing techniques that create a sense of security, a sense that nothing will ever go wrong. It’s discouraging to see patients inundated with advertisements from internet marketing companies, pharmacies, and even beauty salons regarding the safety of contact lens wear. More times than not, most patients do just fine. However, if contacts are not cared for properly, catastrophe can strike. In our efforts to prescribe the best contact lenses at Clarence Eye Care, we’ve seen patients who are misinformed or have “misheard” information about their lens care. We understand that some patients sleep in their contacts that are not approved for overnight wear. There are patients that wear two-week lenses for two months because a friend or co-worker told them that “It’s o.k. to wear them until they feel bad”. Wrong! As a result, we are chronically and constantly trying to educate our patients about the importance of good compliance for long term contact lens success. One of the best ways to wear contacts, in my opinion, in daily disposables. The convenience, compliance, and health benefits of fitting daily disposables increases patient satisfaction and compliance. As your doctor, I can sleep much better at night, knowing that you aren’t sleeping in your contacts. In the morning, I know that you are putting a nice clean healthy contact lens back in your eye (for the first time ever). When you come in for an eye exam and contact lens fitting, we will dispense a 10-day supply of dailies so that you can get a good feel for whether dailies will work for you. Most patients that trial this morality really enjoy the convenience, comfort, and vision of a brand new lens ever day. If you’re a parent, look at the way your child cares for their bedroom. If there are clothes strewn about and an unmade bed, can you feel confident that your child is properly cleaning their contact lenses? Probably not. 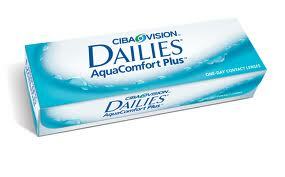 Dailies are also very good for patients with dry eyes or allergies. Most of the daily contact lenses have a moisturizer built into the contact to improve lubrication. Throwing the contact lens out after one day reduces the risk of allergens building up on the contacts which will reduce itching and redness. Hands down, daily contacts are the healthiest way to wear lenses. Come in to Clarence Eye Care for your next contact lens fitting and we’ll pick the best lens for you. Dr. Murphy and Bartels specialize in fitting contacts for keratoconus. We have fit patients from Williamsville, Clarence, East Amherst, New York City, Buffalo, Tonawanda, Akron, Lancaster, Dunkirk, southern New York State and beyond. I name these places to stress the fact that we have patients from all over New York State. We can help you too! Let’s first discuss keratoconus and some of it’s characteristic. Keratoconus literally translated from latin is cornea-cone. Keratoconus is an eye disease that affects the structure and integrity of the cornea. The cornea is the clear tissue covering the front of the eye, just in front of the iris. The cornea slowly changes from the normal round shape to a cone shape. As this occurs, the cornea bulges out taking on a cone-shaped curvature. The cornea also thins where the cornea is the most steep. This causes vision problems as light will no longer pass through the eye in a normal fashion. Many patients with keratoconus experience blurry vision, glare, light sensitivity, halos, and night vision problems. Eye glasses are typically not effective in correcting vision to an acceptable degree. This often leads to frustration for the patient. Most people who develop keratoconus have a history of being nearsighted. The nearsightedness tends to become worse over time. As the problem gets worse, astigmatism develops and worsens as well. Keratoconus is often discovered anytime between adolescence and our third decade of life. The most accurate way to measure the curvature of the cornea and diagnose keratoconus is the use of a corneal topography. Corneal topographers map the curve of the cornea showing areas of flatness and steepness. A slit-lamp examination of the cornea can be used to diagnose the disease in the later stages, however, it is much better to detect and treat this condition as early as possible to reduce the risk of progression. A pachymeter can be used to measure the thickness of the cornea. Contact lenses are the main treatment for most patients with keratoconus. We specialize in finding the most appropriate contact lens for your condition, depending on it’s stage. In the past, the only surgical treatment had been corneal transplantation. With new advancements, we are able to help give you better vision and slow down the disease process with proper contact lens wear. Other treatment options are available and can be discussed depending on the nature of your condition. Briefly, these other options include corneal implants and collagen cross-linking. Intacs are corneal implants which are clear, thin, FDA approved, bio-mechanical PMMA material, semicircular in nature and placed in the periphery of the cornea by an ophthalmologist during a brief outpatient procedure. Intacs corneal implants reshape the curvature of the cornea from within, enhancing the natural shape of your eye to correct mild nearsightedness or reducing the cone shaped cornea for easier contact lens fitting. Because no tissue is removed, natural optics are enhanced and the structural integrity of the cornea is maintained. Corneal collagen cross-linking strengthens the cornea by allowing it to re-form new cross-links between the collagen fibers. These new cross-links help strengthen the cornea which stops the thinning process and further loss of vision. This technique is not currently FDA approved in the United States, however, it is used in almost 70 other countries around the world (as close as Hamilton, ON). In most cases, vision can be corrected or improved with rigid gas-permeable contact lenses, hybrid contacts, or scleral contact lenses. At Clarence Eye Care, we specialize in fitting all of these contacts for your specific need. Young persons whose vision cannot be corrected to 20/20 with glasses should be evaluated by an eye doctor, such as us, experienced with keratoconus. Parents with keratoconus should consider having their child or children screened for the disease starting at age 10. There are no known preventive measures. However, some specialists believe that patients with keratoconus should have their eye allergies aggressively treated and should be instructed not to rub their eyes. NO eye rubbing! If you have more questions, please call us at 716-668-2020 or visit us at Clarence Eye Care, conveniently located at 8560 Main Street in Williamsville, NY 14221. There are six essential nutrients that your eyes need according to more than 20 years of research. Studies have given us a better understanding of how diet and nutrition can reduce the risk of certain eye diseases and continue to keep our eyes healthy. There are several conditions, including dry eye syndrome, macular degeneration, diabetic retinopathy, retinitis pigmentosa, and others that cam be better controlled or alleviated with proper nutrition and vitamin supplementation. The six essential nutrients that we all need include the antioxidants lutein and zeaxanthin, essential fatty acids (omega 3s), vitamin C and E and the mineral zinc. The body does not make these nutrients naturally. It is imperative to incorporate these into your daily diet, and supplement with eye vitamins because they have been proven to help protect eyesight and promote eye health. There is still a misconception out there in the American public that nearly half of Americans (49%) still believe Bugs Bunny favorite food is the best food for eye health. While carrots do contain nutritional value by containing beta-carotene, spinach and the other dark greens kale and collard greens are the healthiest foods for eyes. The dark greens contain large amounts of lutein and zeaxanthin. Lutein and zeaxanthin reduce the risk of developing age-related macular degeneration (AMD). Try to also eat one cup of colorful fruits and veggies such as broccoli, spinach, kale, corn, green beans, peas, oranges, and tangerines four times per week. Studies suggest that omega-3 fatty acids such as flax or fleshy fish like tuna, salmon, herring, whole grain foods, lean meats, and eggs may help protect against dry eye and AMD. Get your vitamin C by ingesting fruits and vegetables including oranges, grapefruit, strawberries, papaya, green peppers and tomatoes. These nutrients can help minimize the risk of cataracts and AMD. Vitamin E can be had through vegetable oils, almonds, pecans, sweet potatoes, and sunflower seeds. Vitamin E is a powerful anti oxidant that can slow AMD and cataract formation. Zinc is important because a deficiency can result in poor night vision and cataracts. Get your zinc by consuming red meat, poultry, liver, shellfish, milk, baked beans, and whole grains on a daily basis. Of course, do not forget to get a yearly dilated eye exam at Clarence Eye Care conveniently located at 8560 Main Street in Williamsville, NY. It’s that time of the year again! Dry eye season blends into allergy season making it difficult to know if your symptoms are due to allergies or dry eye syndrome. Clinically, these conditions can appear very similar in nature. Often, they can coexist together. I was trained that if you hear hoof beats, you should think horses, not zebras. However, sometimes, it’s horses AND zebras. Every patient is entitled to suffer from one or multiple conditions. In many cases, dry eye and allergies overlap one another (and this is a perfect time of the year for that to happen). Let’s consider the old saying “Which came first, the chicken or the egg?”. Did the allergy component flare up first or the dry eye sensation? Dry eye sufferers may have antigens that stay on the ocular surface longer because of plugged lacrimal ducts or insufficient tear production which helps reduce the antigen load, thereby increasing the allergic response. Allergy sufferers, on the other hand, may be on systemic, anti-histamine medication which leads to decreased tear production. These issues lead to difficulty in diagnosing the primary transgressor and choosing the proper therapeutic treatment. Often your optometrist at Clarence Eye Care is going to use both a symptom based approach and clinical differentiation. Itchy eyes is certainly the hallmark of an allergy and is often described as a generalized sensation. Other symptoms that commonly present with acute allergic response are puffy eyelids, red eyes and tearing. All these symptoms have a tendency to be aggravated by antigen exposure and can also be confirmed after a mild time delay from exposure. It may be difficult to detect or diagnose if patients don’t suffer from the usual symptoms of rhinitis or dermatitis though. Dry eye tends to be a disease that is more notable in symptoms than signs, especially in its earliest stages. In the earliest stages of dry eye disease, no signs are produced while more than one symptom may be present. Common symptoms of dry eye disease often present as burning eye, foreign body sensation, nasal tearing and fluctuating vision. Redness of the eyes is common with dry eye disease. Specific and detailed questioning is necessary to differentiate between these two similar conditions. Typically careful clinical observation is also necessary. Therefore, it is important for you to make a trip to see your optometrist at Clarence Eye Care. When you go for your exam, your Dr. Murphy and Bartels understand that allergic issues are typically confined to certain parts of the pink and white parts of your eye. They will also be prepared to examine the common eyelid findings associated with these conditions. Dr. Murphy and Dr. Bartels can also use special dyes to help differentiate one condition from the other. Although dry eye and allergic conjunctivitis can appear similar in appearance, their correct differentiation using both diagnostic approaches is key in developing a treatment strategy. If you suffer from one or both of these conditions, come see us today so we can help you. If you want to slow down myopia, your cornea should look more like the one on the right, not the left. We all know that you can not cure myopia. But, there is an increasing number of options available to help slow it down. As a practice, Clarence Eye Care specializes and emphasizes the importance of doing just that. We understand the importance of controlling myopia in children. As of today, 41% of people in the United States suffer from myopia. By reducing the progression of myopia in children, we can reduce the cost of U.S. vision care and more importantly, we can potentially save them from devastating vision loss due to myopic retinopathy, retinal detachment, and glaucoma that is often associated with the myopia. Practitioners like us have found it difficult and challenging to address parent and patient questions about the methods and treatment options to stop or slow down the progression of nearsightedness. However, new studies are shedding new light on this ever growing epidemic that will soon provide greater detail and more answers to this concern. Here at Clarence Eye Care, we provide a service called orthokeratology (Ortho-K), corneal molding, or corneal reshaping. These are different terms for the same treatment. Ortho-K has long been used to treat myopia in adults and children with great success. Imagine not having to wear glasses or contact lenses during the day. The freedom this provides is priceless. Over time, practitioners have begun to notice that younger patients being treated with Ortho-K had less myopic progression. In recent years, there have been several studies to support this clinical finding. In the Longitudinal Orthokeratology Research in Children (LORIC) study, researchers looked at children and compared them to a historical control group of children wearing conventional single vision contact lenses. The researchers compared to axial length (length of the eyeball) in the children studied. Typically, the longer the eyeball, the more nearsighted you become. So, the goal is to control the eye lengthening process that occurs in nearsighted progression. After two years, the Ortho-K group increased in their myopia by only 0.29 mm and the control group with conventional soft contacts increased by 0.54 mm. That lengthening increase is almost DOUBLE compared to the Ortho-K children. In a separate study, participants wearing corneal molds (ortho-k lenses), experienced minimal changes in myopia after three years of wear, while the average prescription level had worsened in the soft lens wearers. Ortho-K is the primary myopia control method that we use at Clarence Eye Care. We believe that the current literature supports the clinical use of these lenses for myopia control and is an excellent option for our patients. Don’t sit back and watch your child develop progressively worse vision every year. We would love to explain the benefits of corneal reshaping to you and your child. Please call us to schedule an evaluation. We are eager to help you. Today, let’s talk about a technological breakthrough. Transitions have always been a very popular product but they are about to become even bigger! Transitions Vantage adaptive lenses are the only photo-chromatic lenses with variable polarization on the market. This translates into a superior product which offers crisper, sharper vision, even in the brightest outdoor glare. This breakthrough allows these lenses to be almost completely clear indoors and dark outdoors WITH polarization. This is a “smart” lens in that the polarization level adjusts to adapt to the amount of glare that you are exposed to outdoors. This allows the proper filtering of annoying glare caused by light bouncing off everyday objects such as buildings, cars, windows, snow (we live in Buffalo), and water. Eight out of 10 patients surveyed agreed that the lenses enhanced visual contrast, provided better clarity, and gave sharper image and definition outdoors. It appears that there is only one clear choice when it comes to variable polarization…Transitions Vantage, a trusted and reliable name with exciting new technology! Come see us at Clarence Eye Care where our opticians are trained to fit you with the most state of the art technology. A recent study done by Neurology reveled that your optometrist can track the progression of multiple sclerosis (MS) using an ocular computed tomographer (OCT). MS is a neurodegenerative demyelinating disease, that affects multiple areas of the central nervous system, including the optic nerve and retina. The study included 164 patients with MS and 59 healthy control patients. The patients with MS included those with clinically isolated syndrome, relapsing-remitting MS, primary progressive MS, and secondary progressive MS. The study followed patients for 21.1 months with clinical evaluation and annual brain MRI. The optic disk and macula were evaluated with spectral-domain OCT every 6 months. The retinal nerve fiber later (RNFL) was used to monitor the optic disk and the ganglion cell/inner plexiform (GCIP) was used to monitor the macula. Patient with new lesions that had initial onset of MS in the last 5 years suffered the most severe thinning. The GCIP layer appears to be much more sensitive to demyelinating changes as it thinned 46% faster in the MS patients compared to the controls. On the other hand, the RNFL did not thin significantly faster in the MS patients compared to the controls. Overall, GCIP thinning was more of a predictive factor in determining the progression of the systemic condition compared to RNFL thinning. GCIP may become the preferred method of monitoring MS progression in the eye. OCT has proven its benefit in optometric practice. Clarence Eye Care in Williamsville, NY is proud to have the iVue Ocular Coherence Tomography technology, which is capable of performing these tests, ensuring our patients of the most up-to-date technology and care. What is an optician? Opticians primarily determine the specifications of various ophthalmic appliances (eye glasses, contact lenses, low vision aids) that will give you the necessary correction to improve your vision and quality of life. In New York State, opticians are licensed in order to perform these tasks. This is not true in all states. It is my opinion that licensed and professionally trained opticians are going to provide patients with superior knowledge compared to a non-licensed optician. At Clarence Eye Care, on Main Street next to Paula’s Donuts, we have two trained and licensed opticians on our staff. Opticians can work in a variety of setting including private practice, like ours, hospitals, eye care centers, or retail stores. Not only do opticians have to meet standards of practice and training, they also commit to ongoing continuing education. In New York State, opticians are regulated by the Higher Education Department. Opticians are able to consult with a patient to design an ophthalmic lens or other appliances to best meet their needs. It is important for the optician to gather as much information about the patient regarding their daily activities so that he or she may use their expertise to offer the best solution for that patient’s needs. Opticians spend much of their day performing tasks related to eyeglasses. An optician is usually very helpful during the frame selection process. They are very good at assisting in the selection of the proper frame shape. Every face has a unique shape and certain frames look better on certain face shapes. The optician is also responsible for taking measurements for eyeglasses and educating patients on lens choices. Once the selection process is complete, the optician can either place the order with the lab or perform the task of actually cutting the lenses in-house. If your glasses break or a nose pad comes loose, it is often the optician that will repair your frame for you. They are also trained in the art of adjustments. There is nothing worse than a frame that is out of place, uneven, or rubbing on the back of your ear. Find a handy optician to get you comfy and well aligned if you are experiencing any of these difficulties. Stephen and Maria are always willing and able to give a helping hand at Clarence Eye Care. See you soon. What is an optometrist? My name is Michael S. Murphy and I’m an optometrist. An optometrist will never be confused for the middle linebacker for the reigning Superbowl Champion Baltimore Ravens or the heavyweight boxing champion of the world. But he/she may be confused briefly with “Sam the Butcher” from the Brady Bunch or a mad scientist in a chemistry lab (mainly because of the long white coat). Today, I would like to begin to give you some insight into what an optometrist is and does on a daily basis. Many times, patients are confused by the “three O’s”…optician, optometrist, and ophthalmologist I will not cover everything today as our responsibilities are numerous and our training is arduous but check back often as I plan to make this blog part of my weekly routine. Optometrists are trained professionals, often 8 years of schooling (and sometimes more) to earn the degree of Doctor of Optometry (O.D.). They are an integral part of the health care team. Their specialty is to co-manage eye health and vision. They are often independent, primary health care providers who examine, diagnose, treat, and manage disorders of the visual system. They primarily deal with conditions such as nearsightedness, farsightedness, astigmatism, and presbyopia (aging of the eye that causes the need for progressive addition lenses or the dreaded “bifocals”). Many people are unaware that we also diagnose and treat glaucoma. We recommend preventative treatments to slow down or stop macular degeneration and other retinal disorders like diabetic and hypertensive retinopathy. Early intervention and preventative medicine is important to help slow down or reduce the risk of vision loss. We also council our patients on the best options when it comes to multi-focal lens implants after cataract surgery. We treat and manage dry eye syndrome. Dry eye syndrome can often be related to other un-diagnosed or untreated medical conditions. Dry eye is a very common condition but should not be taken lightly when it is a primary complaint of one of your patients. These are just of few of the things that we do. As we move forward in the future, I will continue to expand on these responsibilities and describe these conditions and many more in great detail. Hi! Welcome. I’m so glad you found us. Let me first introduce ourselves. My name is Michael Murphy. My business partner and colleague is David Bartels. We are both doctors of optometry. Our mission is to serve you and your family with whatever eye care need arises. We own Clarence Eye Care and our mission is to provide you and your family with the very best care, comfort, and convenience. This is my first experience blogging and I am excited to bring you fresh content and exciting information on a routine basis. The field of eye care is ever changing and this is an opportunity for me to keep you up-to-date on new and exciting technologies and breakthroughs that just may change your life. Check in often to see what’s new in the world of eye care and Clarence Eye Care!